February 22, 2019 (Nashville, TN) – Known for her unbelievably strong voice and kind, gentle spirit, Madaline Garcia, has an aggressive release schedule this year starting with her new single. “I Am Found” is available now for purchase and streaming across all DSPs via WieRok Entertainment. Madaline’s most recent 2018 EP release, “Christmas With You” experienced major market rotational air play when the title track was picked up on some terrestrial Country and Christian radio stations through the 2018 Christmas season. The single “I Am Found” is part of a series of tracks that will conclude with a CD project in the fall with her label WieRok. Scheduled to release every few months, these are songs of hope and love that will reach believers and non-believers alike. ABOUT MADALINE GARCIA When you hear the name Madaline Garcia, you don’t necessarily thing sweet, quirky blonde girl next door (unless you know her). When you hear Madaline sing, you’ll never forget her. When it comes to music, it’s like turning the knob of perfection to ten. Every lyric is exact from memory. Every note is solid on key and rhythmically succinct and her performance in captivating. Madaline has lived most of her life with thick glasses and very poor vision. In 2017, she received what she prays was her last eye surgery, as she is corrected to near 20/20 vision. Through her struggles growing up, she knew what it was like to be singled out for being different. She’s developed a tremendous compassion for special needs children & adults and has become a champion for special needs organizations. She’s one of the favorite activity leaders for Gigi’s Playhouse in Brentwood, TN. She loves to perform for and with participants at Wellspring Community in Castle Rock, CO a day program for special needs adults. 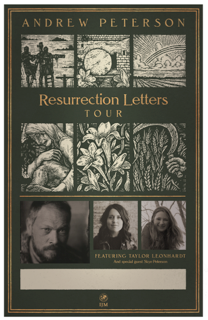 Dove Award-nominated recording artist, songwriter, filmmaker, and award-winning author Andrew Peterson prepares for his second annual Resurrection Letters Tour, with most tour dates booked and tickets going fast (available here). Featuring indie artist Taylor Leonhardt and special guest Skye Peterson, the tour runs April 5 through May 11. The songs have made a powerful impact on audiences across the globe, with the liturgically-inspired track “Is He Worthy?” heralded as “a heavenly glimpse of Jesus’s triumph in one of the best written worship ballads [last] year.”(Hallels). Its one-shot music video has received over 1.2 million views, and the song was recently covered by Grammy-winning CCM artist Chris Tomlin on his latest album. “The first time I heard [“Is He Worthy?”], I knew it was a game changer for the church,” Tomlin said. In addition to the tour, Peterson is gearing up to perform and lead workshops at all seven of the Great Homeschool Conventions this year. He’s also preparing for the release of a nonfiction book in the fall and is recording music for a special project coming the latter half of the year. For tickets and all the latest updates, visit Andrew’s website and join his email list. Keep up with Andrew on Facebook, Twitter, and Instagram. NASHVILLE, Tenn. (February 15, 2019) – Evangelistic husband and wife singer/songwriter duo, The Cashmans, are thrilled to announce a special pre-release campaign for the long awaited national release of their CD, City of God. The project is slated to impact retail March 1, 2019, from CLG Distribution, and will be available digitally from major online retailers, including iTunes, Amazon, and Google Play, at an MSRP of $9.99. About City of God: The City of God project was produced by Grammy nominated, Dove Award winning Producer of the Year Ian Eskelin (Francesca Battistelli, Sidewalk Prophets, Chris August, Hawk Nelson), Grammy, Dove nominated producer/mixer Barry Weeks (Kelly Clarkson, Backstreet Boys, Francesca Battistelli), and Austin Cannon (Vertical Worship, Lincoln Brewster, Christy Nockels), who produced the “City of God” and “All Things New” remixes. City of God features songwriting collaborations with Eskelin, Grammy nominee Sarah Hart (Amy Grant, Celtic Woman, Matt Maher, Laura Story, Audrey Assad), and Dove Award winner, SESAC Country Song of the Year award winner, and CMA & ACM nominee Brian White (Danny Gokey, Mandisa, Rodney Atkins, Rascal Flatts), among others. February 12, 2019 (Springdale, Arkansas) – Legendary CCM entertainer John Schlitt is back at Christian radio with the rock vocalist’s first new music since 2013 with “Fighting the Fight,” a single co-written by Schlitt and Ryan Horn. The single, out today, is being serviced to Christian AC radio through A-Sides Radio Promotion. For more information about the single, contact jeff@asidesradiopromotion.com. “Fighting the Fight,” produced by John Lawry for 4K Records, features Schlitt’s signature vocals paired with authentic lyrics, all wrapped up with melodic instrumentation. Schlitt, best known as the lead singer for Grammy Award-winning Christian band Petra, currently records and tours as a solo artist, as well with The Union of Sinners and Saints, a band featuring Schlitt, former Whiteheart member Billy Smiley and Jason Fowler. Schlitt also brings his lead vocalist talent to The Jay Sekulow Band, a seven-piece ensemble featuring Jay Sekulow, chief counsel for the American Center for Law & Justice and host of his own radio and talk shows. Other band members include Schlitt, John Elefante, Scott Kirkman, Marco Pangallo and Mark Lee Townsend. The group, with a popular following on social media, performs live concerts, as well as records videos. With a career that spans more than four decades, Schlitt first rose to success as the lead singer for popular 70s rock band Head East. Fired from Head East in 1980 because of his alcohol and drug addiction, Schlitt left music behind for five years. It was during that time that the singer was led to Christ through the witness of his wife, Dorla, and their pastor, a decision that also led to Schlitt leaving behind his addiction. Schlitt officially joined Petra in 1986, bringing his unique sound to a band that, during Schlitt’s tenure as lead vocalist, would earn 10 Dove Awards and four Grammys. With a popularity that spans the globe, Schlitt continues a busy schedule that includes touring internationally, as well as appearing on shows, such as “The Mike Huckabee Show,” TBN’s “Praise” and “700 Club Interactive.” His last full length solo CD, “The Christmas Project,” was released in 2013. To learn more about Schlitt, visit johnwschlitt.com, like him on Facebook and follow on Twitter and Instagram.